New Delhi dated the 29th September, 2017. 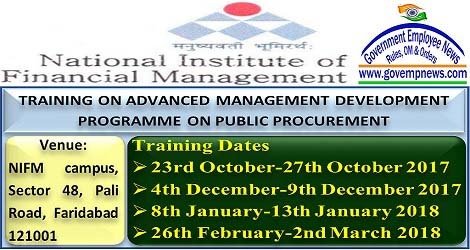 Sub: Training Program on Advanced Public Procurement in National institute of Financial Management (NIFM), Faridabad. 2. All Ministries/ Departments are requested to nominate officers who are currently engaged with procurement directly or indirectly. As the officers keeps on rotating due to transfers etc., even the officers who currently not working in this area can also be sent for these training. The training schedule and brochure for the current financial year received from NIFM is enclosed herewith for information. 3. Ministries/ Departments may also direct their attached/ subordinate offices autonomous/statutory bodies etc. to nominate their officials for these trainings. Complete cost of the training will be borne by the Department of Expenditure. 4 The nominations may please be sent by email at mdpcell@nifm.ac.in or pilania@nifm.ac.in The copy of this OM is also available on website www.doe.gov.in → Notifications → Circular/ OM/Notifications → Procurement Policy/OM. Any further query in this regard may be sent to NIFM/undersigned. Secretaries/ Financial Advisors of all Central Government Ministries/ Departments.